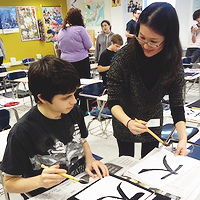 The Japan in the Schools (JIS) program, started in 1997, is a unique program that brings Japanese education into classrooms in Western PA. A wide variety of topics are covered in visits to local schools. Some topics include Japan today, Japanese history, language, culture, and origami. Download the curriculum flyer[PDF] for more information. Volunteers of the JIS program respond to outreach requests from elementary, middle, and secondary schools, libraries,and other community partners. Authentic Japanese materials are used as teaching aids. This unique experience broadens a student's view of the world and the cultures in it. Requesting a school visit is easy! Fill out this simple request form and Katsuko Shellhammer will coordinate the details of the visit. Volunteers are the most essential part of the JIS. Without the help of dedicated and passionate volunteers, this program would not exist. All ages and nationalities are welcomed. The only requirement is a passion for Japan. Sign up today!